Progress on the "to-do" list has been slow but mostly continuous up to this point. Speed has been hampered somewhat by the current weather pattern. Not sure if this is normal, but the pattern is either cold and windy or warm and rainy. I have to admit that this year my joints are not terribly happy with the weather and folding myself up into the nooks and crannies of the boat has been trying at times. Yet every day the boat closer to the way we left it. One issue I've dealt with was a minor fuel leak that the caretaker for our boat recently found. Apparently over the course of the year (or at least a good portion of it) a tablespoon or so of diesel had made its way into the bilge. We initially tried getting a local company to fix the leak, but they were unable to find anything. The only "problem" they could identify was that the Racor fuel filter "may" have leaked and offered to rebuild it for a pretty hefty sum. Since I was unconvinced that this was the problem, I decided I would check on it when I came down. I crawled down into the engine compartment and was rather quickly able to find that the fuel supply hose was showing age and was seeping just a bit. In the process of removing the hose it became fairly apparent it was the cause. The hose was replaced, new fuel filters and accompanying gaskets were installed and the system was checked for any signs of leaks. None were found. I checked fluid levels and then started the engine. Despite the age and hours on the motor, it started right up and ran like a top. I let it run for a little while and repeated my leak check and it all checks out great now. Then there is the fact that 5 of the 6 fire extinguishers on board the boat were made by Kidde. Just in case you weren't aware, there was a recall of around 40 million Kidde fire extinguishers. Given boats are required to have working fire extinguishers on board and I had no idea how long it would take to get any warranty replacement, dealing with them was high on my list and one of the early things I checked when I returned to the boat. Fortunately, I found that none of the extinguishers on board were impacted by the recall and the boat was good to go on that front. The rainy weather helped to point out another issue, a leak on the boat. The aft berth overhead hatch was leaking. It was the only hatch that I had yet to re-bed, so it isn't isn't much of a surprise that it would be the one to leak. On one of the few relatively warm and dry days I was able to pull the hatch, clean it up, and re-bed it. Rains that followed tested my work and confirmed that the leak has been fixed. Another item that I didn't expect to deal with was the lifeline netting. 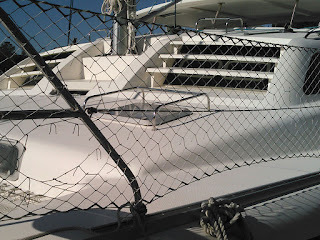 When I arrived at the boat I was quite surprised to see a number of holes and broken strands in the netting. At first I thought someone had come along and vandalized it. But after tugging on it a bit myself, I found the netting to be quite brittle. Obviously this netting, sold at West Marine, is not UV protected and a couple years in the sun has all but destroyed it. If anything were to fall against the netting, I have no doubt that it would give way and whatever it was supposed to prevent going overboard would end up in the water. Since it was now useless and looked ugly to boot, I spent quite a bit of time removing all of the netting that we painstakingly added just two years ago. So, if you are thinking of adding netting to your lifelines, I think I can safely say you should avoid the stuff sold by West Marine. Given how long it takes to properly install, you will really want a better netting. Look for netting that clearly states it is protected against UV. So, work continues, in between rain and wind storms.